Amazon EC2 R5 instances are the next generation of memory optimized instances for the Amazon Elastic Compute Cloud. R5 instances are well suited for memory intensive applications such as high performance databases, distributed web scale in-memory caches, mid-size in-memory databases, real time big data analytics, and other enterprise applications. Additionally, R5d and R5ad instances have local storage, offering up to 3.6TB of NVMe-based SSDs. R5a and R5ad instances feature AMD EPYC processors with an all core turbo clock speed of up to 2.5 GHz and offer a 10% cost savings over R5 instances. R5 instances support the high memory requirements of certain applications to increase performance and reduce latency. R5 instances deliver additional memory per vCPU and the largest size, r5.24xlarge, provides 768 GiB of memory, allowing customers to scale-up and consolidate their workloads on a fewer number of instances. R5 instances are powered by the AWS Nitro System, a combination of dedicated hardware and lightweight hypervisor, which delivers practically all of the compute and memory resources of the host hardware to your instances. This frees up additional memory for your workloads which boosts performance and lowers the $/GiB costs. R5 instances feature the Intel Xeon Platinum 8000 series (Skylake-SP) processor with a sustained all core Turbo CPU clock speed of up to 3.1 GHz. R5 instances provide support for the new Intel Advanced Vector Extensions 512 (AVX-512) instruction set, offering up to 2x the FLOPS per core compared to the previous generation R4 instances. New R5a instances feature the AMD EPYC 7000 series processor with an all core turbo clock speed of up to 2.5 GHz. 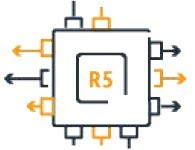 R5a offers up to 10% savings for customers who are looking to further cost optimize their Amazon EC2 compute environments. R5 instances have a 1:8 vCPU to memory ratio, with the largest size offering up to 768 GiB of memory per instance, allowing applications to scale up on fewer instances. This makes R5 instances ideally suited for applications such as high-performance databases, distributed in-memory caches, in-memory databases, and big data analytics. R5 instances are also available as bare metal. Customers looking to further boost the performance of their workloads, such as in-memory databases, can take advantage of R5d and R5ad instances with instance storage to improve memory swap performance. R5d and R5ad instances offer up to 3.6TB of NVMe-based SSDs and are available in the same sizes as R5 instances. R5 instances are built on the AWS Nitro System, a rich collection of building blocks that offloads many of the traditional virtualization functions to dedicated hardware. By doing so, the AWS Nitro System enables high performance, high availability, and high security while also reducing virtualization overhead. The R5 and R5d instances feature the Intel Xeon Platinum 8000 series (Skylake-SP) processor with a sustained all core Turbo CPU clock speed of up to 3.1 GHz. Additionally there is support for the new Intel Advanced Vector Extensions 512 (AVX-512) instruction set, offering up to 2x the FLOPS per core compared to the previous generation R4 instances. R5a and R5ad instances feature AMD EPYC 7000 series processors with an all core turbo clock speed of 2.5 GHz. The AMD-based instances provide additional options for customers that do not fully utilize the compute resources and can benefit from a cost savings of 10%.